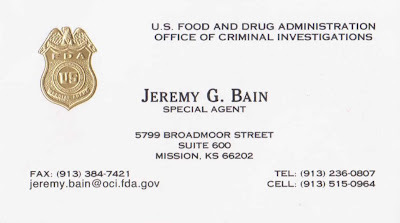 On July 11, 2012, Dr. Carpenter's Lase Med Inc. clinic was raided by eight uniformed officers of the FDA, who claimed to be acting on complaints by three people we now know as disinformants, whose slanderous articles about Carpenter have been on the web for over three years, complaints that she was "selling false hope." Even though they staged a raid based on a few complainants, they never spoke with any of Dr. Carpenter's successful patients before coming to take everything. One of the disinformants is connected to a former patient, whose embellished story was told by her widowed husband, and used as a key witness in the aforementioned Federal Case against Carpenter. The embellishments focused on key elements of the patient's history that were purposely omitted. As mentioned before, none of Dr. Carpenter's defense witnesses were allowed to be heard by the jury, a jury picked by only one side of the case. Now Dr. Carpenter cannot perform her treatments, patient appointments must be cancelled and some may die as a result, as this was their last hope. Dr. Carpenter's rent and expense money was in the safe and now that is gone as well. Dr. Carpenter has been rendered bereft and unable to make a living now, all because she offers an effective treatment for cancer which does not involve deadly poisons and cancer causing radiation. This is an outrage and should not be tolerated by the American public. Dr. Carpenter's property must be returned.